All Star Wine, online a allstarwine.com, is the destination a great selection of wine. Located in upstate New York, All Star Wine is proud to provide delicious wines for customers across the country. All Star Wine offers all types of wines from around the globe, including 90+ wines, reds, whites, sparkling wines, champagne, and much more at discounted prices. 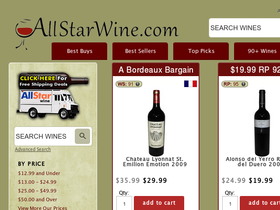 Also, All Star Wine offers recommendations with top picks, best sellers, and best buys. So enjoy a plethora of wines for less at All Star Wine. But before you shop, get all the latest allstarwine.com discounts, All Star Wine promotions, All Star Wine coupon codes found here at RetailSteal.com. All Star Wine ships to most states within the U.S., and offers free shipping on select wines. See site for more information. Shop at Allstarwine.com and enjoy $5 savings when you sign up with e-mail. Click here. Save up to 35% on wines from All Star Wines. Click link to shop and save on top picks and more. Save up to 35% on 90+ wines from All Star Wine. Click link to shop and save on a great selection. Use coupon code at All Star Wine to get free shipping on your purchase of 12 or more wines in the free shipping section. Click link to shop. Enjoy free shipping on select wines at All Star Wine. Click link to shop and save. Shop All Star Wine for wines starting for only $1.49. Click link to shop and save big. Shop the Tops Picks at All Star Wine and find great wines starting from only $12.99. Click link to shop.